In 1981, S. Robert Lichter, then with George Washington University, and Stanley Rothman of Smith College, released a groundbreaking survey of 240 journalists at the most influential national media outlets — including the New York Times, Washington Post, Wall Street Journal, Time, Newsweek, U.S. News & World Report, ABC, CBS, NBC and PBS — on their political attitudes and voting patterns. Results of this study of the “media elite” were included in the October/November 1981 issue of Public Opinion, published by the American Enterprise Institute, in the article “Media and Business Elites.” The data demonstrated that journalists and broadcasters hold liberal positions on a wide range of social and political issues. This study, which was more elaborately presented in Lichter and Rothman’s subsequent book, The Media Elite, became the most widely quoted media study of the 1980s and remains a landmark today. 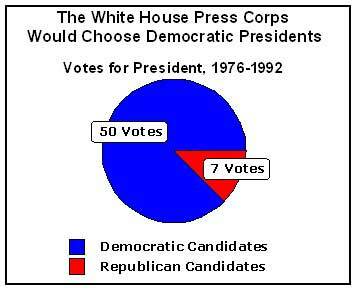 81 percent of the journalists interviewed voted for the Democratic presidential candidate in every election between 1964 and 1976. In the Democratic landslide of 1964, 94 percent of the press surveyed voted for President Lyndon Johnson (D) over Senator Barry Goldwater (R). In 1968, 86 percent of the press surveyed voted for Democrat Senator Hubert Humphrey. 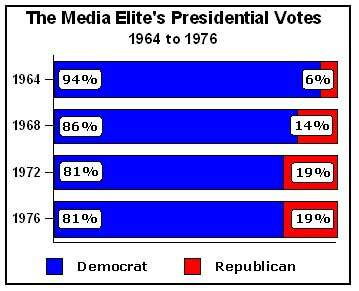 In 1972, when 62 percent of the electorate chose President Richard Nixon, 81 percent of the media elite voted for liberal Democratic Senator George McGovern. In 1976, the Democratic nominee, Jimmy Carter, captured the allegiance of 81 percent of the reporters surveyed while a mere 19 percent cast their ballots for President Gerald Ford. Over the 16-year period, the Republican candidate always received less than 20 percent of the media elite’s vote. In 1995, Kenneth Walsh, a reporter for U.S. News & World Report, polled 28 of his fellow White House correspondents from the four TV networks, the Los Angeles Times, New York Times, USA Today, Washington Post, Copley, Cox, Hearst, Knight-Ridder, plus Newsweek, Time and U.S. News & World Report, about their presidential voting patterns for his 1996 book Feeding the Beast: The White House versus the Press. Walsh found that his colleagues strongly preferred Democrats, with the White House press corps admitting a total of 50 votes for Democratic candidates compared to just seven for Republicans. In 1992, nine of the White House correspondents surveyed voted for Democrat Bill Clinton, two for Republican George H. W. Bush, and one for independent Ross Perot. In 1988, 12 voted for Democrat Michael Dukakis, one for Bush. In 1984, 10 voted for Democrat Walter Mondale, zero for Ronald Reagan. In 1980, eight voted for Democrat Jimmy Carter, four for liberal independent John Anderson, and two voted for Ronald Reagan. In 1976, 11 voted for Carter, two for Republican Gerald Ford. In 1982, scholars at the California State University at Los Angeles asked reporters from the fifty largest U.S. newspapers for whom they voted in 1980. In that election, Republican Ronald Reagan won with 50 percent of the vote, compared with 41 percent for Democratic incumbent Jimmy Carter and 8 percent for liberal Republican-turned-independent John Anderson. 51 percent of big city reporters cast a ballot for Democratic President Jimmy Carter, 24 percent for liberal independent candidate John Anderson, and 25 percent for the Republican winner, Ronald Reagan. In 1985, the Los Angeles Times conducted one of the most extensive surveys of journalists in history. Using the same questionnaire they had used to poll the public, the Times polled 2,700 journalists at 621 newspapers across the country. They found that by a margin of two-to-one, reporters had a negative view of then-President Ronald Reagan and voted, by the same margin, for Walter Mondale in 1984. When asked how they voted in the 1984 election, more than twice as many newspaper journalists chose liberal Walter Mondale (58 percent) over the conservative incumbent Ronald Reagan (26 percent), even as the country picked Reagan in a 59 to 41 percent landslide. Times staff writer David Shaw expounded: “When asked ‘How would you describe your views on most matters having to do with politics?’ 55 percent of the newspaper journalists say they’re liberal (12 percent say ‘very liberal,’ and 43 percent say ‘somewhat liberal’), and only 23 percent of their readers say they’re liberal (five percent say ‘very liberal,’ and 18 percent say ‘somewhat liberal’). In 1995, Stanley Rothman and Amy E. Black “partially replicated the earlier Rothman-Lichter” survey of the media elite described above. “The sample of journalists mirrors that from the earlier study, including reporters and editors at major national newspapers, news magazines and wire services,” the authors wrote in a Spring 2001 article for the journal Public Interest. When it came to voting habits and ideology, the authors found the media elite maintained their liberal bent, providing strong majority support for Democrats Michael Dukakis in 1988 and Bill Clinton in 1992. More than three out of four “elite journalists,” 76 percent, reported voting for Michael Dukakis in 1988, compared to just 46 percent of the voting public. An even larger percentage of top journalists, 91 percent, cast ballots for Bill Clinton in 1992. That same year, only 43 percent of voters picked Clinton, who nevertheless won a three-way race. In April 1996, the Freedom Forum published a report by Chicago Tribune writer Elaine Povich titled, “Partners and Adversaries: The Contentious Connection Between Congress and the Media.” Buried in Appendix D was the real news for those concerned about media bias: Based on the 139 Washington bureau chiefs and congressional correspondents who returned the Freedom Forum questionnaire, the Washington-based reporters — by an incredible margin of nine-to-one — overwhelmingly cast their presidential ballots in 1992 for Democrat Bill Clinton over Republican incumbent George Bush. 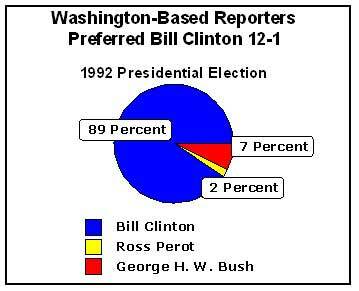 89 percent of Washington-based reporters said they voted for Bill Clinton in 1992. Only seven percent voted for George Bush, with two percent choosing Ross Perot. In January 1998, Editor & Publisher, the preeminent media trade magazine, conducted a poll of 167 newspaper editors across the country. Investor’s Business Daily reporter Matthew Robinson obtained complete poll results, highlights of which were featured in the MRC’s February 1998 MediaWatch. In 1992, when just 43 percent of the public voted Democrat Bill Clinton for President, 58 percent of editors surveyed voted for him. In 1996, a minority (49 percent) of the American people voted to reelect Clinton, compared to a majority (57 percent) of the editors. When asked “How often do journalists’ opinions influence coverage?” a solid majority of the editors (57 percent) conceded it “sometimes” happens while another 14 percent said opinions “often” influence news coverage. In contrast, only one percent claim it “never” happens, and 26 percent say personal views “seldom” influence coverage. New York Times columnist John Tierney surveyed 153 campaign journalists at a press party at the 2004 Democratic National Convention in Boston. 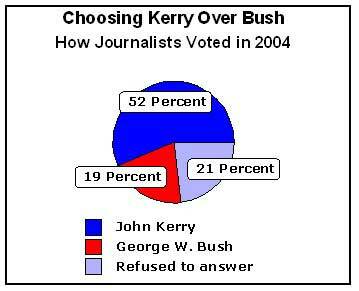 Although it was not a scientific sampling, Tierney found a huge preference for Democratic Senator John Kerry over incumbent Republican President George W. Bush, particular among journalists based in Washington, D.C. He found that journalists from outside Washington preferred Kerry by a three-to-one margin, while those who work inside the Beltway favored Kerry’s election by a 12-to-1 ratio. In March and April 2005, the University of Connecticut’s Department of Public Policy surveyed 300 journalists nationwide — 120 who worked in the television industry and 180 who worked at newspapers and asked for whom they voted in the 2004 presidential election. In a report released May 16, 2005, the researchers disclosed that the journalists they surveyed selected Democratic challenger John Kerry over incumbent Republican President George W. Bush by a wide margin, 52 percent to 19 percent (with 1 percent choosing far-left independent candidate Ralph Nader). One out of five journalists (21 percent) refused to disclose their vote, while another six percent either didn’t vote or said they did not know for whom they voted. More than half of the journalists surveyed (52%) said they voted for Democrat John Kerry in the 2004 presidential election, while fewer than one-fifth (19%) said they voted for Republican George W. Bush. The public chose Bush, 51 to 48 percent. When asked “generally speaking, do you consider yourself a Democrat, Republican, an Independent, or something else?” more than three times as many journalists (33%) said they were Democrats than said they were Republicans (10%). While about half of the journalists said they were “moderate,” 28 percent said they thought of themselves as liberals, compared to just 10 percent who said they were conservative. One out of eight journalists (13%) said they considered themselves “strongly liberal,” compared to just three percent who reported being “strongly conservative,” a four-to-one disparity.